India, as all developing countries is plagued with the problem of rampant ‘Child Labour’ being employed even by established companies either directly or indirectly. Children are employed in various industries be it textiles, garments or jewelry related industries or small road-side shops and hotels. Frequently we see sting operations conducted by NGOs exposing how child workers are used even by multi-national textile companies indirectly through outsourcing of tasks. The usage of children as domestic help is the most rampant urban abuse of children as labourers. A recent rescue of a child working as a domestic help was carried out in Delhi. The report states that the child was made to drink urine, kept naked in the bathroom, was singed with frying pans and hit with brooms. The article shows how child labour is treated in India and the torture they have to face. India currently has an estimated 2.4 mn child workers as per the 68th NSS survey[i]. If we include the part time workers[ii], this number shoots up to 3.22 mn. The working children are primarily boys who carry the burden of the patriarchal social construct in their roles as protectors/ providers of the family and at that young age have to shoulder the responsibilities of the family. Still India has special schemes for education and development of a girl child and not for a boy child. 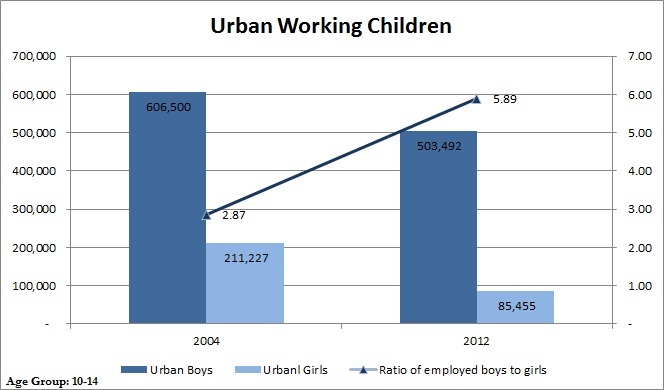 If we see the charts above, the number of urban working children has not reduced. 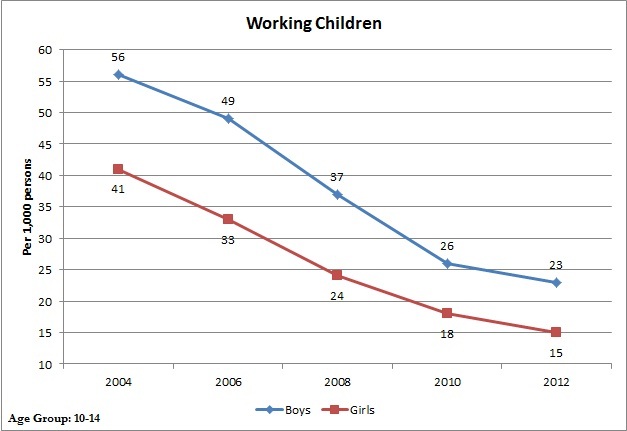 The disparity is stark in the ratio of working boys to girls. It has in fact increased[ii] from 2.9x in 2004 to 5.9x in 2009 implying that roughly 6 underage boys work for every underage working girl. 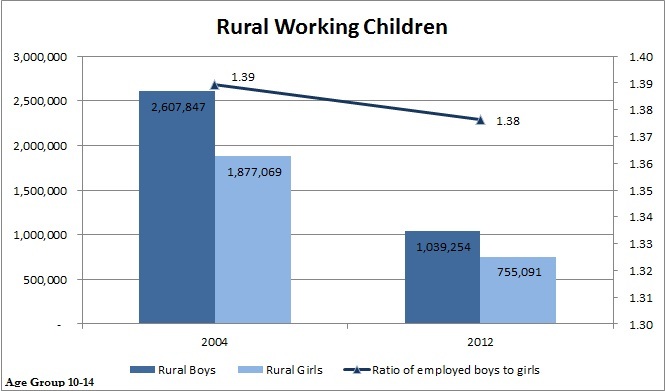 This trend which shows that boys are employed as child labour, six times more than girls is very disturbing, as the childhood of these children is being snatched away from them at a very tender age. 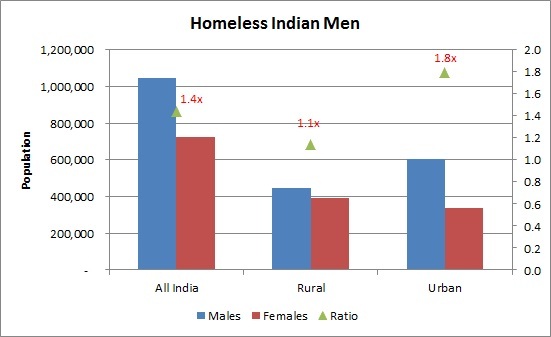 Over the years inspite of embracing a progressive outlook, the role of burdening young boys as ‘providers’ to shoulder the family responsibility has not changed even a bit as is evident from the chart below. India is the only country in the world which celebrates a Children’s Day, inspite of having all the good intentions and policies, we have to reflect why the young boys are still being forced into growing as ‘men’ sooner than they should. There is also one more trend that has come to the fore in recent times. Are we sending our young to work because our women are voluntarily choosing to go out of the Labour Force? [i] Based on Usual Principal Status Approach. The estimate is derived by multiplying estimated population in the age group and per 1000 working population for that age group. [ii] Based on Usual Principal Status Approach & Usual Subsidiary Economic Activity Status approach. The estimate is derived by multiplying estimated population in the age group and per 1000 working population for that age group.